When it came together, BRICS was primarily an economic forum. However, indications are that it is also moving to become a forum to represent political interests of member countries. Since parliaments would play a significant role, to ratify agreements that the leaders have worked out and harmonize legislation alongside the deepening integration, it is possible that BRICS may have a parliamentary assembly, along the lines of the Parliamentary Assembly of the Council of Europe (PACE), as early as next year. 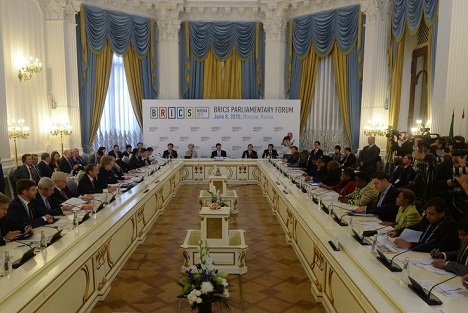 BRICS held its first ever parliamentarians forum in Moscow on 8 June. Participating legislators agreed at the meet to begin exploring the possibility of creating a parliamentary (or inter-parliamentary) assembly. According to Russian parliamentarians, the final decision on the creation of such a body might be made as soon as next year, at the forum scheduled to be held in India. According to Vladimir Dzhabarov, First Deputy Chairman of the Federal Council Committee on International Affairs, the chief purpose of such an inter-parliamentary forum would be to harmonize the legislation of member countries. It would also be additional platform for discussion where parliaments will be able to prepare recommendations for leaders. Vasily Likhachev, member of the RF State Duma Committee for CIS Affairs, Eurasian Integration, and Relations with Compatriots, agrees. “Parliaments will be able to raise and discuss any questions. The results will be brought to the consideration of the countries’ leaderships,” said Likhachev. Likhachev explained that the BRICS parliamentary assembly can assume two fundamental tasks. The first is developing legislation that can be aligned as a group and standardised for each member country. The second is to bring legislators together to resolve the most critical issues, like nuclear non-proliferation, reforming international institutions, reforming the IMF, and defending international law. As five countries, “it will be possible to develop various inter-parliamentary international initiatives,” said Likhachev. Russia and China, for example, are promoting initiatives at the UN for the demilitarization of outer space and for introducing a code of conduct in the information sphere, he noted. Parliaments will have to ratify documents and adopt the laws needed for integrating the BRICS countries. Inter-parliamentary dialogue will help to simplify the implementation of decisions in national legislation. “First of all, we are speaking of the launch of the New Development Bank (the international financial organization that will be governed by the BRICS member countries) and the Currency Reserve Pool (a unique insurance fund in case a BRICS member encounters financial difficulties or a budget deficit),” he said. Questions about cooperation in the sphere of energy, advanced technology, and so on are also being discussed. “An analysis of the legislation of BRICS countries will now be conducted. Approaches to cyber-security will be studied attentively,” added Zheleznyak. Russian-Chinese parliamentary relations are developing most speedily at the moment. An expanded session of the inter-parliamentary group for cooperation between Russia and China was held in Moscow from June 8 to 10. The Chinese presented a whole list of problems in the legislative area on which they sought Russian inputs. “The creation of a legal system in the vector of state security, international relations building, and giving a new impulse to technological development [is underway]. For China, as an example, the topic of foreign agents is currently relevant,” said Likhachev. “A convergence of the two legal systems is taking place. The Silk Road economic zone involves attachment with the EEU (Eurasian Economic Union, which includes Russia, Kazakhstan, Belarus, Armenia, and Kyrgizia). It is necessary to address the issues related to harmonization of the legislation,” added Likhachev. It is to accomplish these tasks that specialized bilateral commissions composed of parliamentarians have been created.